This Christian Blog is written by author, Katherine T Owen. 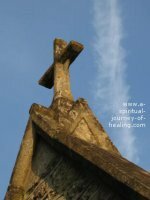 Katherine runs this website, www.a-spiritual-journey-of-healing.com. She lives in Wiltshire, UK. My beliefs in some ways do not fit neatly with those of the church. But there was a time on my spiritual journey when I became more and more compelled by the Bible. I was housebound at the time with chronic illness and received great spiritual sustenance from receiving the sacrament through a weekly visit from a priest. 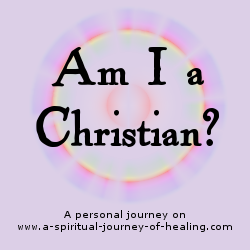 I asked God if I should now call myself a Christian again, and also whether I should call myself a Catholic Christian. I rarely watched TV. My friend (a non-Christian) rang and told me I must watch a program called The Monastery. I taped it and watched it in 10 minute chunks as the ME/CFS symptoms in my eyes and head would allow. It was well worth the trips to the sitting room in my electric wheelchair. Fr Christopher Jameson, took 5 men into his monastery at Worth Abbey, Sussex, UK for 40 days and 40 nights. 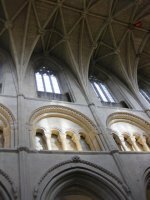 The aim was to see if the monastic tradition has anything to offer the modern man. Here were catholic monks quoting Ghandi and reading books on how to lose the ego. Their faith was grounded in practical reality. One of the monks worked with young children with Leukaemia. The faith of the monks touchingly met the men where they were and found the best in them. ...The Monastery was a truly beautiful series, full of people seeking the truth, asking honest questions and receiving hones answers. One of the men had a spiritual awakening on camera. I still remember how extraordinary it was to see that.. The beauty of these catholics and the recognition of their capactity for peace and forgiveness by non-Christian friends felt like part of God's answer. At the time the mobile library would deliver audio books for me to listen to. I received an autobiography of Alex Guiness. I listened in small sections as the cognitive difficulties allowed, and found out that Alex Guiness had converted to Catholicism. Pondering on whether he had any regrets, his only one was to have found his beloved Church so late in life. One of my carers - a catholic - gave me a hymn book. One of my concerns about religion was the divisions within it. But the hymns were of both catholic and protestant origin and the lyrics often spoke to me powerfully. Yes, spirituality can be found outside religion. But clearly it was also alive and kicking within religion. Suddenly these postive experiences of Catholicism were coming into my life. "Can I call myself a Catholic Christian?" Which denomination? Where do I go to church? After my dramatic improvement in CFS / ME in 2008 I started to attend a catholic church and a more evangelical church on alternate weeks. I was open to attending a church of whichever denomination, allowing God to lead me. I found that all the denominations have both strengths and weaknesses. However, in each one I have experienced the love of God and the power of the message of Jesus. Until God nudges me to go elsewhere, at the moment I attend a catholic church. Inspiring catholics sharing their spirituality. The inspirational Christian with the interfaith approach who was assassinated whilst peacefully taking interfaith initiatives in Pakistan.